Searching for appropriate technologies: IFPRI’s agri-tech toolbox – One Billion Hungry: Can We Feed the World? Of course this infographic only highlights some of the results of the project. Alongside the infographic, IFPRI have published a policy note and also created an online app that allows users to explore how agricultural and food security indicators will change in 2050 by selecting a country or region and a technology, climate scenario, crop and water management practice. The hope is that such a tool will lead to better and more impactful decision making regarding investments and developing policies. The toolbox also helps identify the technologies most appropriate to the conditions on the ground, although nothing can compare to direct knowledge from the farmers themselves. 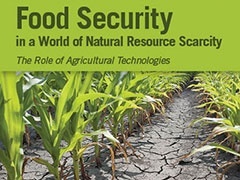 While technology is only part of the solution to feeding a growing world under increasingly difficult conditions, this work shows it can have a huge impact, and where technologies already exist, it can have impact in the immediate future. According to IFPRI, the most urgent next steps are to increase investment in developing new technologies while also scaling up existing technologies; to increase investment in irrigation technologies and to develop and disseminate technologies that conserve natural resources.